Model number "1907," as imprinted on the underside, along with Gorham's "lion, anchor, G" emblem, "Sterling," and a date letter for "1880," this mug is large and exceptionally attractive. Furthermore, it references significant historicity in its inscription. It stands 3 5/8" tall, has a diameter of 2 7/8", a maximum span of 4 3/8" to the end of the handle, and weighs just under 6.0 T. oz. 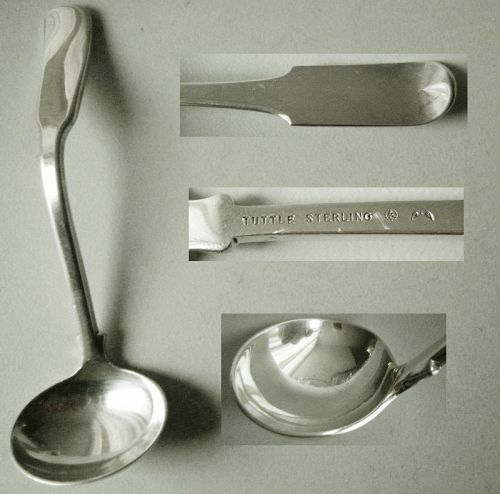 A replica of a style that has its origins in the pre-Georgian era (see Old Friends item 2971f), this pair of sugar nips carry hallmarks in two places for London, sterling silver, 1921, and maker HF, likely Harrison Fisher, which was a Sheffield based firm. They measure 4 5/8" long, are 1 3/4" across at the handles when closed, and open to a span of 3 5/8" at the shell grips. Weight is .9 T. oz. Well-proportioned and clean looking, this presents in a quietly stately manner. 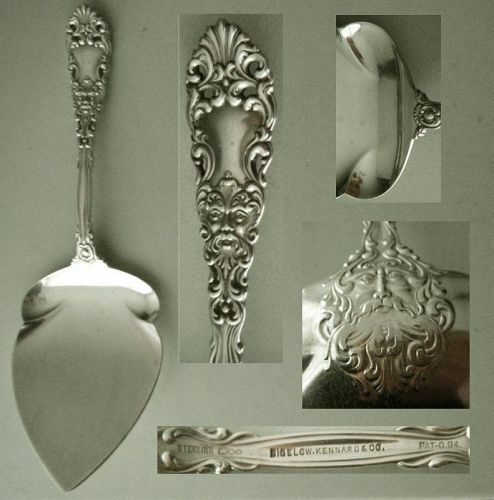 Made by Tiffany & Company, it is so marked on the underside, along with "Sterling Silver," "925/1000," and an "m" for John C. Moore II, director from 1907-47. Dating from the 1850s, and measuring 8 7/8" long and weighing approximately 1.9 T. 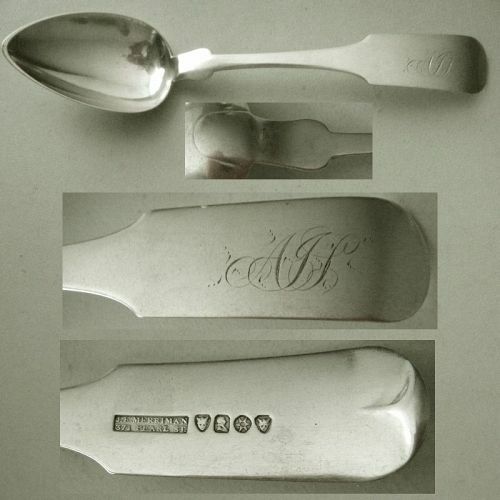 oz., this coin silver berry or other serving spoon is stamped "P.L.K." 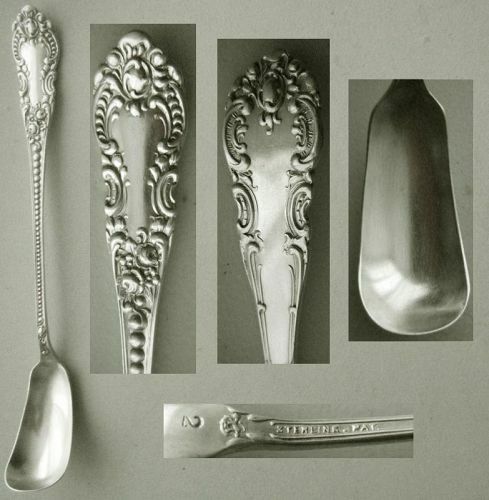 for the Philadelphia silversmith Peter L. Krider. Relatively plain in design, it nonetheless bespeaks its origins. Stamped with the word "Sterling," model number "145," and the name "Shreve Cump & Low Co.," for Boston's premier jeweler, this pitcher stands 4 1/2" to the rim, 5 5/8" to the highest point on the top of the handle, sits on a square base that is 2 5/8" on a side, and weighs a relatively heavy 5.8 T. oz. Operating for a short time in New York City, 1837-40, James Edward Merriman, spent the majority of his working years, 1841-65, in Memphis, Tennessee. The specific mark on this 7 1/4" long, 1.1 T. 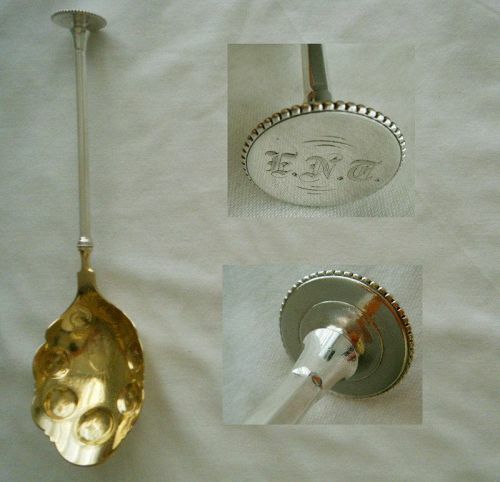 oz., "Reverse Tipt," coin silver, place spoon, "J.E. Merriman/123 Pearl St.," traces to his New York period. 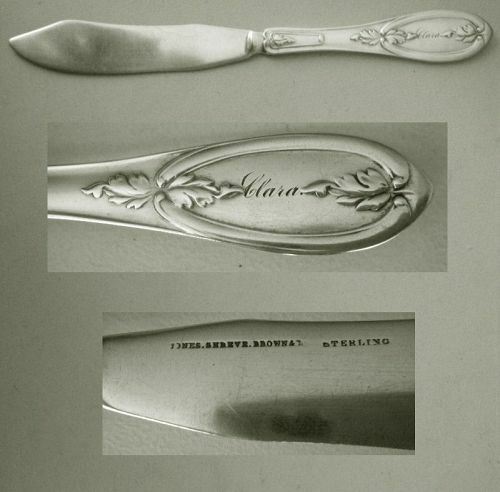 It is accompanied by a "leopard head, bust, star, leopard head" pseudo hallmark that John McGrew in his volume on manufacturers' marks attributes to an unknown New York City source. Although commonly referred to as "Old English," this pattern is identified in the Gorham archives as "Old English." It follows after an early English pattern that is characterized by a flat disk that surmounts the end of the faceted shank. The disk has a knurled edge, and in this case is engraved with an "E.N.T." monogram. Likely dating from the 1880s, this 4 1/2" wide, 2" high to the rim, 4" to the top of the swing handle, 2.4 T. oz., basket, shows Aesthetic design influences. The rim is scalloped and the tapered sidewalls are undulating. 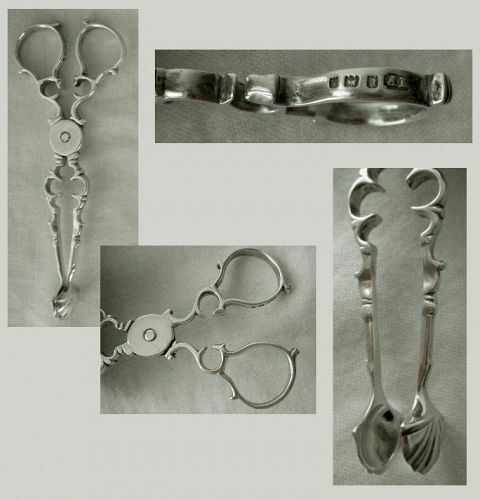 The solid handle is twisted, with a smooth, square, grip at the top.